Countries and Concepts, an Introduction to Comparative Politics. Countries and Concepts; an Introduction to Comparative Politics was written by Michael G. Roskin. Countries and Concepts; an Introduction to Comparative Politics was published by Prentice Hall. About Michael G. Roskin (Author) : Michael G. Roskin is a published author of young adult books. 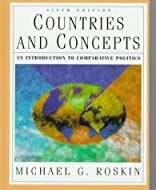 Some of the published credits of Michael G. Roskin include Countries And Concepts: AP Edition.